The Central Fire Station was located at the corner of Texas Avenue and San Jacinto Street. This image shows the mix of motorized vehicles and horse-drawn equipment in use in the early 1920s. Night view of a building in downtown Houston decorated with lights for the No-Tsu-Oh Carnival. There is a lighted sign that reads "Union Bank Trust Co."
Photograph of a reproduction of a map created by Gail Borden, who was commissioned by the Allen brothers to produce a map of the city. The "Original Plan of Houston" shows a city hugging Buffalo Bayou with space reserved for a courthouse, churches, and schools. 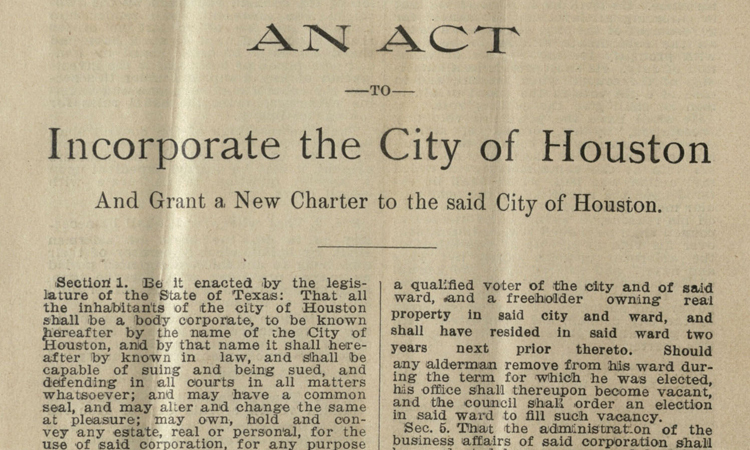 Image of the front page of a newspaper published by "The Houston Post" on April 22, 1910. Prominent headline in the top left of this newspaper announces the death of Mark Twain. A view of the San Jacinto Monument displaying the prominent star at the top. A view of a World War I homecoming parade, looking south on Main Street from Rusk Avenue. The parade is moving north on Main Street and is led by Red Cross representatives. Parked cars line the street as many unidentified people crowd the edge of the parade route. Photograph of a painting depicting a futuristic view of Houston in 1980 as imagined by an unknown artist in the 1920s or 1930s. A view looking south onto Travis Street from Texas Avenue. Pedestrians walk along the sidewalks and cross the street. Automobiles travel the street. Streetcar rails are seen in the pavement and wires for the electric trolley cars run overhead. 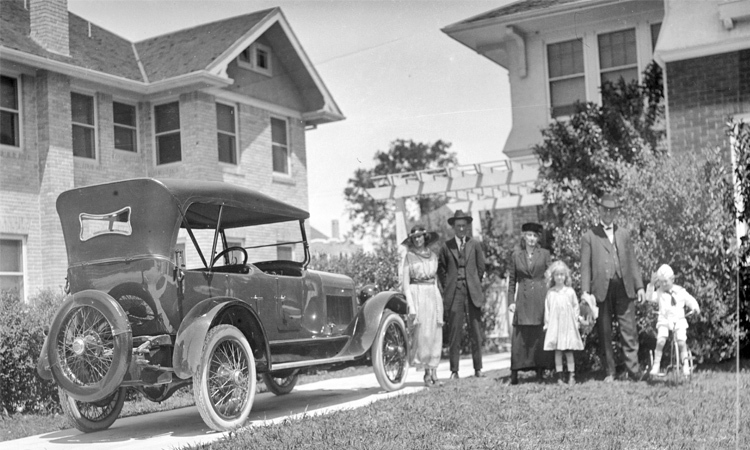 The digital collection contains 236 photographs of Houston dating back to the 1800s and early 1900s, including images of downtown, monumental buildings and landmarks, and daily activities in the lives of citizens. Legendary Houston newspaperman and historian George M. Fuermann gathered these photographs over the course of two decades for his book research; most are copy prints of earlier photographs, but some are originals. The George Fuermann Texas and Houston Collection is an extensive group of materials amassed by Fuermann between 1950 and 1971. 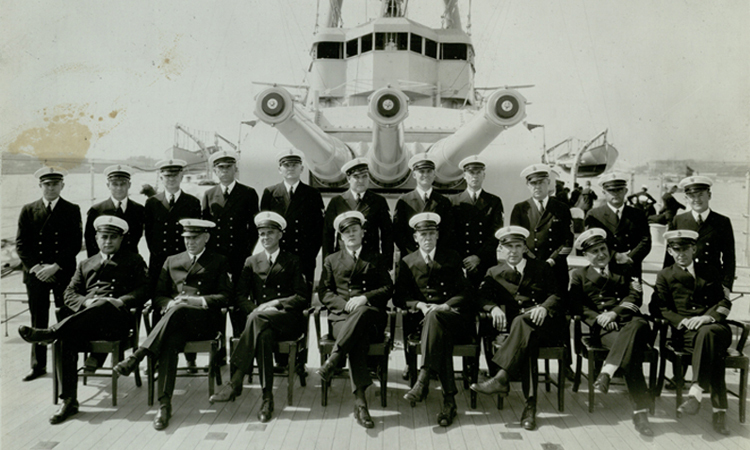 Among the collection’s highlights are over 800 photographic prints that document Houston’s history and enterprise. A small set of images depicts other cities such as Huntsville and San Antonio. 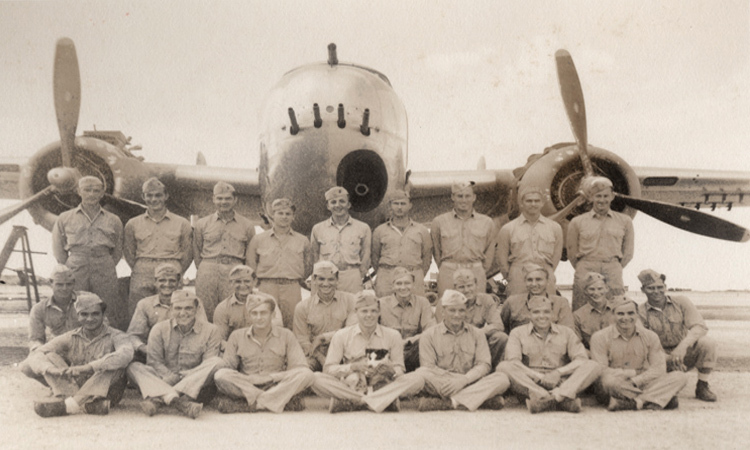 The images available in this digital collection represent only a subset of the photographs in the Fuermann Collection - those that are no longer under copyright and are in the public domain. George Fuermann’s career with Houston daily newspaper the Houston Post spanned 49 years, beginning in 1946 as a general assignment reporter. From 1950 to 1971 he wrote a popular daily column, based on snippets of local history, called “Post Card.” Fuermann continued as Editorial Page editor from 1971 to 1983 and as “Wine Talk” columnist from 1984 to 1995, when the Houston Post closed its doors. Fuermann also published approximately ten books, mostly on the history and people of the city of Houston. Among his best known books are Houston: Land of the Big Rich, 1951; Reluctant Empire, 1957; The Face of Houston, 1963; and Houston: The Once and Future City, 1971. The original materials are available in UH Libraries’ Special Collections in the George Fuermann "Texas and Houston" Collection. Flower arrangment interpretation of "Houston Land of the Big Rich"